The weather has been erratic lately. One day the girls are running through the yard in their flip flops and the next day they are wearing snow boots building a snowman. This weather has even triggered the tulips. They are starting to pop up out of the soil. I want to put little coats on them and tell them it’s not quiet time to display their splendor. I find it fascinating that when conditions are right, a seed or in this case a bulb, emerges from a dark wet place all on its very own. The laws of nature are amazing. Watching a plant emerge from a tiny seed into a plant is one of my favorite parts of gardening. My enthusiasm for gardening is spreading, as I have three close friends (Amy, Katy, Mary) with plans to start their very first gardens. I’m so excited to share the gardening experience with them. Current discussions center on where to place their garden and what they plan to grow. In these discussions I always emphasize the important components of healthy soil. Right now, I will focus on nitrogen in the soil. Are you ready for a science lesson? If you remember Jr. High science class you may already know all of this. Nitrogen, phosphorus and potassium are the three primary nutrients needed for plant growth and development; nitrogen being the most important. Nitrogen deficient plants look sick; they often are yellow, weak and if they produce fruit it will be small. Nitrogen is in the Earth’s atmosphere and the air that we breathe. Plant roots get nitrogen through the soil, not the air. Just as my girls prefer cooked carrots over raw carrots, plants prefer a specific type of inorganic nitrogen. In a natural occurrence, soil microorganisms convert nitrogen into an inorganic form that can be consumed by plants. 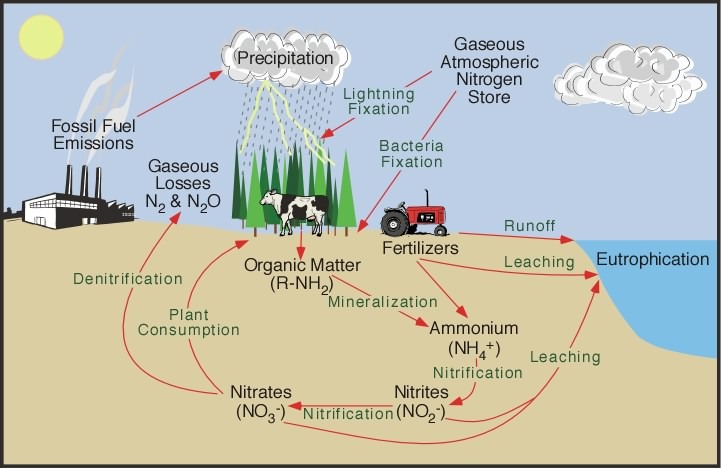 This process is called the nitrogen cycle, where nitrogen passes from the air to the soil, to plants and animals and then returns to the air or soil through plant and animal decay. Nitrogen can also be converted through an industrial process. According to The Fertilizer Institute in Washington, D.C., anhydrous ammonia is the largest source of nitrogen in commercial fertilizer. It is produced by mixing nitrogen and hydrogen gases in the presence of heat, pressure and a catalyst compound. In order for our way of life to remain the same, commercial fertilizer such as anhydrous ammonia and urea are added to replenish nitrogen deficient soils. Without the proper nutrient levels, soil will not sustain the global needs for housing, shelter, food and fiber. Nitrogen not taken up by plants can be lost to run-off (drain off), erosion or leached into ground water. Excess nitrogen does not benefit anyone. Therefore, farmers and agricultural professionals have implemented different methods to ensure the proper use and application of nitrogen. As a homeowner and gardener we must follow the lead of farmers and consider our impact on the environment. When amending our soil with nitrogen, whether through commercial fertilizers, manure or legumes, follow the 4Rs. Right Place – Match amount of fertilizer to plant needs. Follow label directions.